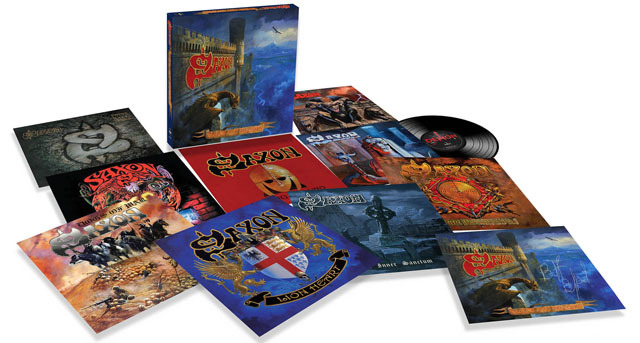 Share the post "Album review: SAXON – Eagles And Dragons (9-vinyl box set)"
Nine albums, nearly twenty years in timespan, and another chance for recycling under the auspices of 180 gram vinyl. This means you don’t get bonus tracks, just the original albums in original sleeves and inners and some new artwork on the box. It does, however, enable a re-evaluation of a period in Saxon’s history when they sauntered from the heavy to the slightly power/pomp metal and back again, an era when they latterly resisted a makeover via reality TV but which underlined they had maybe lost their way a bit in the affections of a wider audience. Saxon’s work in the 90s is often overlooked, which is a shame, because it often surpasses the ‘glory years’ of the early 80s. Solid Ball Of Rock (1991) and Forever Free (1992) were both solid heavy rock albums in the face of latter-day hair metal and if neither offered up hit singles it did reflect that those particular glory days were over, a trend that had in fact started a decade earlier. Dogs Of War (1995), the last to feature guitarist Graham Oliver, was a move away from the trad metal of old and now much more a power metal sound. 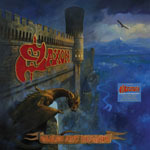 It’s not the most consistent album Saxon ever produced, but a new direction, with Biff on top form, bassist Nibbs Carter (who joined in 1988) doing a fine job, and guitarist Paul Quinn and drummer Nigel Glockler playing their hearts out. It formed a template for their next album, the superb Unleash The Beast (1997), the first to feature current guitarist Doug Scarratt and is arguably their best offering during the 1990s and it was even enough to keep the prevalent grunge metallers at bay, with standouts including ‘Terminal Velocity’, ‘Circle Of Light’, ‘The Thin Red Line’ and ‘The Preacher’. Metalhead (1999) and Killing Ground (2001) were again solid albums and the latter was originally released with a bonus CD of live tracks that eventually appeared on Heavy Metal Thunder. The 2001 album includes a version of King Crimson’s ‘Court Of The Crimson King, and the superb ‘Hell Freezes Over’. On first listen the 2004 set Lionheart isn’t as immediately catchy as some of the 90s releases (such as Unleash The Beast) but give it a few spins and it all seems to grow on you rather well. ‘Witchfinder General’ is a real heavy opener whilst the title track is classic Saxon but updated for grunge-addled ears. The pace is kept up for the entire album, a quality modern production that’s not over polished and a real gem throughout. On 2007′s The Inner Sanctum the band kept their hard edged metal sound whilst nodding back to their more polished production of the albums in the ’80s epitomised by ‘Need For Speed’ and ‘Let Me Feel Your Power’ whilst ‘State Of Grace’ is the most melodic number. On the anthemic ‘I’ve Got To Rock (To Stay Alive)’ they sound like Def Leppard circa ‘Pyromania’ but matters are redeemed with ‘Attila The Hun’ – big guitar riffs, neat solos, very heavy rhythm section and a strong, memorable chorus. This box set is rounded off by Into The Labyrinth (2009) building further on the return of long-time drummer Nigel Glockler in 2005. Incorporating elements of power metal (‘Battalions Of Steel’, ‘Hellcat’), and the historical (“Demon Sweeney Todd” and “Valley Of The Kings”). The album also offered a single in the form of the superb ‘Live To Rock’ (with an intro very reminiscent of “Solid Ball Of Rock”). The bottleneck blues version of “Coming Home” was a portent of the “acoustic” album released in 2013. This entry was posted in ALBUM REVIEWS, ALBUM REVIEWS (Mobile), All Posts, Reissues and tagged album, Biff Byford, box set, Dogs Of War, Eagles And Dragons, Forever Free, heavy metal, heavy rock, Into The Labyrinth, Killing Ground, Lionheart, Metalhead, review, Saxon, Solid Ball Of Rock, The Inner Sanctum, Unleash The Beast, Vinyl. Bookmark the permalink.